But the chances for production are very unlikely. 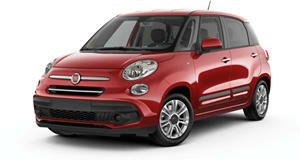 We’ll outright admit that we’re not the biggest fans of the Fiat 500L. However, this latest concept revealed by the automaker is at least a decent effort to make the awkward-looking crossover look decent, if not somewhat cool. Called the 500L Vans Concept, it just had its official debut at the Vans US Open of Surfing in Huntington Beach, California. Yes, Vans as in the shoe and skating company. The concept’s styling is inspired by the lifestyle of those who love to skate and surf. Perhaps the most prominent feature on the concept are those four rings of LED daytime running lights on the front grille. Below them are two foglights. The idea is to allow the beachside party to continue well into the night. The concept also has a three-tone exterior color scheme complete with the Vans checkerboard pattern on the roof, where a rack has also been placed to hold two surfboards and other related gear. Step inside and you’ll discover a dashboard covered with Vans stickers from years past. Like Vans shoes, the seats are made from canvas. Even the waffle sole tread pattern covers the pedals and storage bins. The 1.4-liter turbo four engine hasn’t been altered, and the concept will be on display until August 3.